While a gourmet grocery that even offers Valet Parking, Gourmanoff wisely does not permit pets in store, and offers no pet sitting service at the entry. 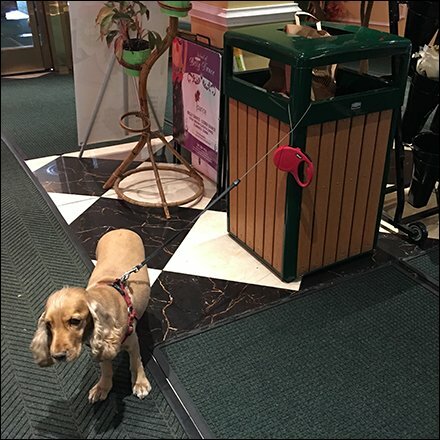 A heavy waste receptical is available as anchor for fido’s leash. Tethered he seemed quite calm and happy to wait for his owner. Probably because he knows a snack will be his reward. Since fido was sheltered within the store entry, sidewalk pet kidnappers missed him as a target. Nice pup. Seen at Gourmanoff Gourmet Grocery, Brighton Beach, Brooklyn.